Lodging options weren’t always great in Bimini, until a new resort opened a few years ago on 750 acres. BIMINI, The Bahamas — As rebrandings go, Bimini is doing a lot of winning. This westernmost atoll of the Caribbean archipelago, the favored fishing grounds of Ernest Hemingway in the last century, over the years has not been known as the most polished destination in the Bahamas. The old Bimini Bay resort complex at the top of North Bimini grew a bit shabby but not particularly chic, content to draw day-trippers and boaters from Florida — including, infamously, presidential candidate Gary Hart and Donna Rice on the yacht “Monkey Business,” an infidelity scandal that can only be described as quaint today. Big-game fishing enthusiasts had a fine time at the rustic Big Game Resort in Alice Town, but the Compleat Angler, the hotel and bar where Hemingway worked on “To Have and Have Not,” burned down in 2006, and severe weather since has taken its toll. Through it all, however, the open secret remained: Whatever the lodging options were, the nearly 9-square-mile set of three islands, just 50 miles east of the Florida coast, is a place of pristine beaches, mangrove lagoons, and windswept outer cays — a marine playground for both sport and bonefishing, snorkeling at coral reefs and a shipwreck, and cavorting with sting rays and dolphins. Now comes Resorts World Bimini, a partnership of Genting Malaysia Berhad and RAV Bahamas, a well-established developer on the island, with extensive new construction and renovations across 750 acres at the top reaches of North Bimini. In June 2015 the resort officially transitioned to a new 300-plus-room Hilton-branded hotel. The resort is enveloping, with three pools, including a rooftop infinity layout and a lazy river, six restaurants (a darn good sushi cafe among them), shops, and a brand new casino. 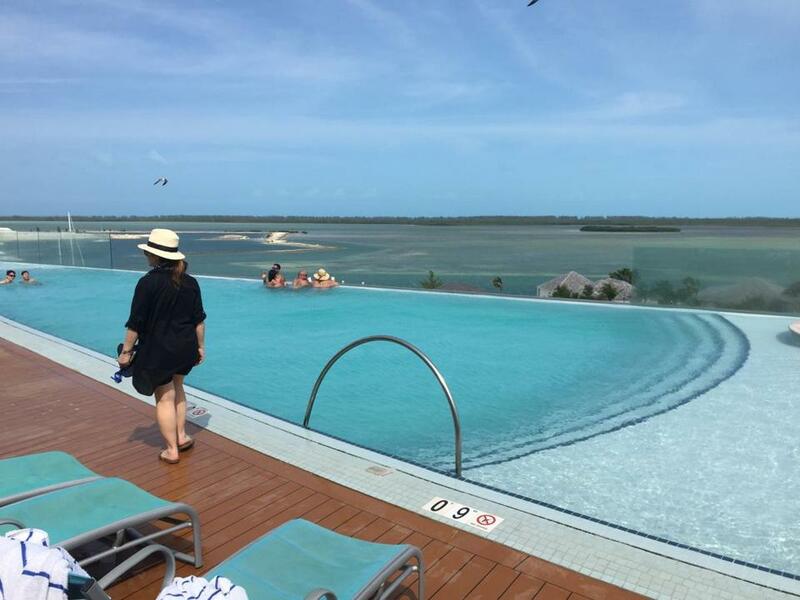 The main hotel building fronts on a canal with a view to the marina, a smattering of private villas on a man-made island, and Bimini’s interior bay. Paradise Beach — being renamed White and Blue beach, for the creamy sand and see-through water — is a half-mile walk or golf cart ride to the north. There’s plenty of programming, including glass-bottomed kayaking, paddleboards, and jet skis. The upgrade in hospitality builds on Bimini’s major selling point: its convenience. It’s the closest part of the Bahamas to get to, whether from Florida or the Northeast. A new jetty accommodates a fast ferry from Miami or Fort Lauderdale. We chose a route with a bit of adventure in getting there: after a three-hour nonstop flight from Boston to Fort Lauderdale on Delta, we transferred to a Tropic Ocean Airways seaplane for a 25-minute hop to Bimini. The big pontoons of the Cessna Grand Caravans touch down on the water just south of the resort and the pilots taxi-slash-sail to a dock and headhouse, where golf carts await to bring guests to the front entrance of the hotel. Leave in the morning, be at poolside by midday. Making the travel arrangements for April school vacation week was a little last-minute, as once again we couldn’t get it together to visit Tulum or Costa Rica or the Florida Keys. The resort helped us build an itinerary of daily activities that made it look like we planned everything well in advance. We started with bonefishing, taken out on a whaler by veteran guide Bonefish Ebbie. He scoured the dappled flats for where the fish were, taught us how to bait the hook with shrimp, cast out, and slowly reel it in. Our stalking paid off as we landed several silvery beauties that put up their legendary fight. Not a bad way to start a vacation, out in the great wide open. Next was wading with the sting rays at Honeymoon Harbor, a short trip to the south on a dive boat operated by a French-born captain, making us feel like we were with Jacques Cousteau. We splashed in just off the beach of Gun Cay, into a full-on ballet of rays large and small. They nuzzled at our shins and sucked up little bits of bait held between thumb and forefinger. On the return we snorkeled at the partially submerged Sapona shipwreck, a concrete hill cargo steamer that ran aground in a hurricane in 1926. It had been used as a floating casino and booze warehouse during Prohibition, got thoroughly bombed as target practice during World War II, and now is one of the easiest ways to check off a shipwreck dive on the bucket list. The last day was reserved for swimming with bottlenose dolphins out on the open ocean to the west of North Bimini, where expert guides scanned the waters for activity, and at just the right moment, commanded us to jump in with masks and fins as quickly as possible to join them. That’s about as much stress as there was on the whole trip, and our boys enjoyed getting a little competitive. Sharks are abundant around Bimini as well, including sinewy hammerheads. While a shark research center on South Bimini shares its educational activities with the public, a shortcut for live sightings is to head to the deck at the bar at Big Game in Alice Town at sunset, grab a margarita and conch fritters, and wait for some hulking bull sharks to cruise around the blue-green waters below. My friends started ribbing me for all the pictures of sharks and dolphins and sting rays I posted on Facebook. (Hashtag #BiminiBliss). One drew the line at my close-up of a carved-out coconut, umbrella, and straw, in the shade of a tiki hut. No apologies. Every single one of our activities quieted the eye-rolling churlishness of the 14-year-old. At least until we got back to the room. Don’t be fooled by the quick trip from the Northeast: the sun is blazing, 45 SPF all the way. I found myself in need of a long-sleeved shirt, which I found at the Hilton lobby gift shop — a handsome white stretchy fabric number emblazoned with the seal of Kalik, the Bahamanian lager. Despite the price I also picked up a Resorts World Nike cap that I wear to this day. It may have been some of the best hotel gift-shop shopping I’ve ever done. Not everybody is on board with the big plans. Bimini has been scrappy, authentic, and a little bit undiscovered; the construction activity has been nonstop north of Bailey Town, prompting concerns about both the human and marine ecosystem. Dredging for the jetty and earth-moving in general have been environmental disruptions, a proposed golf course would also have a major impact, and while many appreciate the new jobs, some Biminites worried about such a headlong rush to being a major tourist and second-home destination. Accordingly, getting off campus is a prerequisite. Take a golf cart down King’s Highway for fried lobster and cracked conch at Joe’s, Stuart’s, and Sherri’s Beach Bar. Knock on the door and seek a private tour by local historian Ashley Saunders of the Dolphin House, adorned inside and out with found items. (“The beach is my Home Depot,” he says.) At the end of the road is a rustic beach, a cemetery, and a forested spit of land jutting out with views all around. It’s not duty-free shopping in Nassau, but that’s the point. Thoroughly relaxed by departure day — a Friday — we sought a few more hours past checkout before boarding the seaplane for the return trip to Florida. A fast ferry had disgorged passengers coming for the weekend, and a line had formed at the front desk; some appeared to have gotten a jump on the partying on the boat over. At the lazy river pool bar, with the mandatory submerged barstools, a tattooed, bikini-clad twentysomething saw on her phone that Avicii had died, and everyone raised their Kaliks in his honor. The thumpa-thumpa music grew louder, and the sweet smell of cigars was in the air. It was almost enough to make one want to go in and play some blackjack. Is it the Bimini Martin Luther King Jr. found, when he escaped here to write his “mountaintop” and other speeches? Not entirely, but a place this vivid would never stay the same for long. A transformation is underway and there’s no turning back. As long as the hotel sushi and Sherri’s flash-fried black pepper conch can coexist in reasonable harmony, the island should be fine.